…but what about my meeting notes? In a recent post, I discussed the evolution of office paper. Since I started my productivity consultancy in 2007, I have seen tremendous, and successful, efforts to reduce reliance on paper in business processes. But, then there are meeting notes. Should you continue with paper (longhand) note-taking? Or, like many other processes, are electronic methods more efficient? In a future post, I’ll talk about electronic options for note taking. A 2014 study by Mueller and Oppenheimer rocked the world of modern academics. These researchers dared to show that students who took notes on a laptop performed meaningfully worse on conceptual questions than those who took notes longhand. The laptop notes crowd experienced shallower cognitive processing of the information. In the 90s, I took meeting notes on the conveniently-labeled “Notes” page of my trusty Franklin Planner. Then, when I needed to refer to them later, I had the fun (and time-consuming) task of trying to remember the date of the meeting where I took the notes. I never could force myself to make a table of contents for each month like they told me to. I see few Franklin Planners today, but I do see a fair number of moleskine-like books. They’re like a work journal…a novel about your professional life chronicled by the meetings you attend. Moleskine-lovers must have a better memory for meeting dates. Or, they enjoy reliving those meeting memories. Ahh, remember that time we argued for an hour about that $577 expense? I like to keep things very simple – for me and for my clients. I am past the days of asking myself or others to follow a 32-step flow chart and attend a user conference to better manage time. 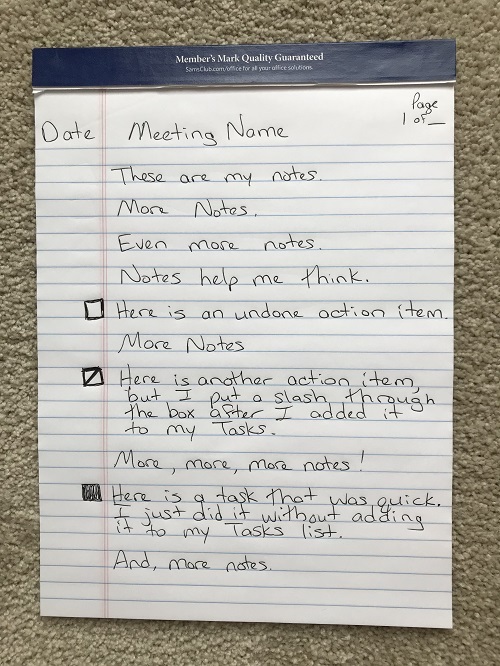 I’d make more money if I created my own 32-step task management process and sold it to you in a glossy box with a magnetic closure, but that’s not in your best interest IMHO. So, in the spirit of simplicity, here is my recommended method for paper-based note-taking. Below, is a sample of how this works. Why does this method of taking notes during a meeting work? The pad of paper is letter-sized and perforated at the top. You remove the pages at the end of every day. This is not a diary of your work life that is organized chronologically. The notes can be scanned and saved with the meeting/project files (and shredded after). The notes are stored in context, not by meeting date. Because the paper is letter-sized, it can be filed into a hard copy file if that’s how you are maintaining that info. You can clearly see what action items you have from the meeting. An open box is an undone action item. A slashed box indicates an action item that not complete but has been added to your centralized task management tool. A completely colored-in box is a completed task. I thank my Franklin years for this technique. You put a date (including the year), page numbers, and the name of the meeting. No mystery notes for you! I believe that most meeting notes should be treated as temporary reference materials, rather than as workplace novels or business records. I expand on this issue in this post. If you believe otherwise, this method may not work for you. Since I have yet to produce a glossy box with magnetic closure, the best way to improve your productivity is by engaging me as your coach. It’s not nearly as intimidating as it sounds, I promise. I’ve helped hundreds of people change their work lives using simple, but powerful, productivity tools. Please email me to schedule a no-cost-to-you initial assessment. You can even take some notes while we talk. I use a letter-size, disc-bound planner/journal with removable pages and create a table of contents in the front with the page numbers, meeting topic, and date. It’s easy to remove a page to make a copy (then re-insert it), and the table of contents makes it a breeze to find specific notes. That sounds wonderful, Ruth! The table of contents was always my kryptonite. Kudos to you for your systematic approach. I completely agree that taking handwritten notes improves your performance and allows you to remember more of what transpired. During the 25+ years of teaching, I saw first hand the difference between those students who took notes and those who didn’t. I began teaching how to take notes. Verbatim notes are too cumbersome to review and you get lost in the minutia of detail. Bullet points organize the information making it easier to remember and reference the information. Research has shown that when we handwrite something, we hear it, we see it (actually watching yourself write,) and we physically create a memory path in our brain through the action of writing. Electronic notes do not create the memory paths necessary to recall information. Great article and here is to handwriting notes!